The youngest son a wealthy New England fishing family, he left Earth to try and make his name on Mars, free from associations with mass market frozen seafood. 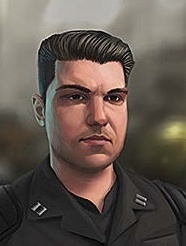 It worked to an extent, but everyone on the force still calls him “fishstick.” However, he is respected for his work in solving a lot of undercity murders that no-one else has been interested in taking on, mostly due to his many undercity connetions. He’s willing to play a little loose with the law to get info, trying to build trust of the MCPD in the undercity. Of course, since every other cop on the force only goes to the undercity to stage raids and bust heads, this is slow-going. Late 30’s male human. Killed during the chaos of the nanopocalypse.